A famous musician, Ian Curtis, I think, explained in his suicide note – ‘there’s nothing left to write about’. Wow. What a statement. 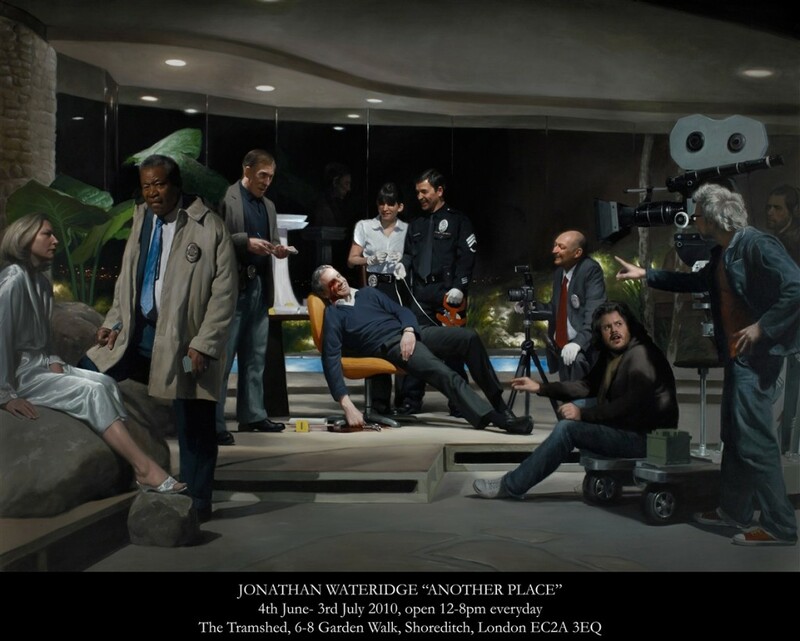 It’s the absolute definition of writer’s self destrcutive pessimism and it makes me think how differently I feel now after seeing Jonathan Wateridge’s solo exhibition in Shoreditch. My fingers want to take over from where my ravenous eyes left off this morning. But, alas, time is not on our side. So this pithy review will most certainly be revisited and reinvested into. For now, I just want to make sure you go see it. 7 huge tableau’s, oil paintings in the grand tradition prepared and painted simulataneously over 14 months, depict ‘Another Place’. An in-between twilight world of staged disaster scenes where the viewer glimpses, jumps into and jumps out of moments of … of what? It’s hard to say. Interrupted moments within recreated scenes from Jonathan’s imagination. Movie sets it seems, set in LA, a place the artist has never been to. A place many of us haven’t been to and yet we have. LA has been implanted in our pysche, a process begun at a very young age when we would sit cross legged on the carpet to watch the small screen. Acted (or ‘played’) by the artist’s friends and a few extras when friends didn’t suit – Jonathan was keen to use real people as opposed to actors for the work. The figures have a Manet-esque solidity and the sense of ceremony and staged surrealness found in Courbet, particularly his Funeral at Ornans. The themes are very strong but the actual narrative is qute open for the most part and the viewer can take the role of detective. Having not used oil paints since he was 18, like many seeing painting as an embarassing anachronism in the 90s (“the little granny who farts unwittingly in the corner of the party”), it is hard to believe that this is Jonathan;s first serious foray with the medium as a mature artist. He says he feels comfortable with the medium now that he recognises it for what it is – for its limits as well its possibilities and his celebration of the material is just that. A true celebration. A very beautiful one dare I say the word. 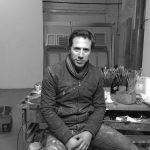 Unfortunately, there is no time at present to go into detail with even a fraction of the intricacies of even one of the paintings in ‘Another Place’ yet alone the works as a series. The accompanying catalogue is definitely worth a good scour too. Great reproductions and the essay is enlightening with sufficient references, questions and suggestions to guide you through. And happily devoid of the jargon. This entry was posted in FEATURES and tagged all visual arts, AVA, Claire Flannery, Jonathan Wateridge. Bookmark the permalink.